Genuine OEM Canon Ink Cartridge, Gray, 780 page yield. Canon part number: CLI-251GY, 6517B001, 6517B001AA. Compatible Canon Ink Cartridge, Cyan, High Capacity 660 page yield. Replaces Canon part number: CLI-251C XL, 6449B001, CLI-251XL Cyan, CLI-251CXL, CLI-251XLC. Compatible Canon Ink Cartridge, Magenta, High Capacity 660 page yield. Replaces Canon part number: CLI-251M XL, 6450B001, CLI-251XL Magenta, CLI-251MXL, CLI-251XLM. Compatible Canon Ink Cartridge, Yellow, High Capacity 660 page yield. Replaces Canon part number: CLI-251Y XL, 6451B001, CLI-251XL Yellow, CLI-251YXL, CLI-251XLY. Compatible Canon Ink Cartridge, Black, High Capacity 4,425 page yield. Replaces Canon part number: CLI-251BK XL, 6448B001, CLI-251XL Black, CLI-251BKXL, CLI-251XLBK. Compatible Canon Ink Cartridge, Black, High Capacity 500 page yield. 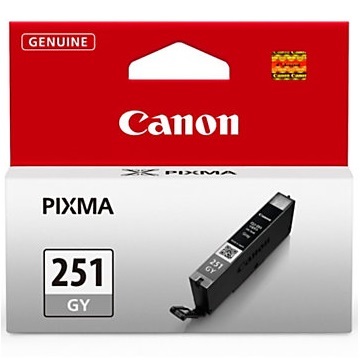 Replaces Canon part number: PGI-250PGBK XL, 6432B001, PGI-250XL Black, PGI-250PGBKXL, PGI-250XLPGBK. Compatible Canon Ink Cartridge, Gray, High capacity 660 page yield. Replaces Canon part number: CLI-251GY XL, 6452B001, CLI-251XL Gray, CLI-251GYXL, CLI-251XLGY.